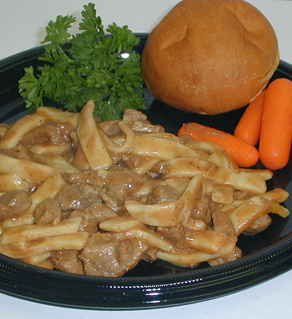 Captain Ken’s BEEF & NOODLES is made with diced sirloin tips that are slowly cooked for extra tenderness. The meat is then added to a rich, smooth beef gravy with complementing spices and homemade egg noodles. Another comfort food favorite from the Captain’s kitchen that will satisfy the heartiest appetite. Add a tasty lightly butter dinner roll and the meal is complete. 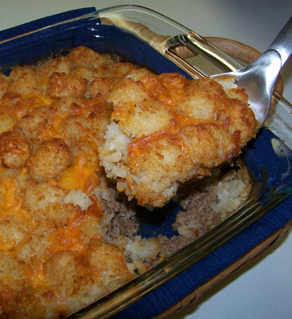 TATER TOT CASSEROLE is another Captain Ken’s favorite. It follows our tradition of quality comfort food and is made with fresh ground beef, diced onions, and blended seasonings in a creamy chicken soup, and then topped with a generous layer of tater tots and cheddar cheese. It will be a sure hit for both young and old. Just place in oven to heat, then serve. Add a side dish of your favorite vegetable such as corn, green beans or carrots. A true meal that’s tasty and hearty with quality Captain Ken’s customers have grown to enjoy for nearly 50 years.